To those who offered suggestions on how how to bind-off my toe-up sock -- thank you! I'm going to try your suggestions this weekend, and I'll report back on the results next week. There's been a lot of protesting from Alison regarding my progess on the zip-up cardigan race project coordination we're having. And since she's got smaller gauge, is planning the sure-to-be massive Sockapaloooza, is under the weather, and just scrapped an entire project... I figured I'd take it easy on her this week and focus on something(s) else. One day while wondering the knitblog world, I stumbled upon this post over at Pepper Knits. 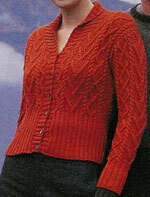 She had knit Pam from Rowan 30 -- a pattern that calls for Rowan Wool Cotton -- in Debbie Bliss Wool Cotton. It just so happened that I'd been holding on to a bag of Debbie Bliss Wool Cotton for over six months waiting for the perfect project. Sometimes waiting pays off. Reinforced with the knowledge that somebody else had done it before me, I charged ahead with the finer-gauge yarn. Halfway up the back, I started to really worry about running out. So I e-mailed Minty Fresh -- with whom I have had no previous contact, mind you -- and she responded quickly and cheerfully with some very good information, not to mention an offer to swap me some balls of yarn if she had the color I needed (unfortunately, I don't think she does). How helpful is she?! I'm still pretty worried about running out of yarn, but I'm going to knit a sleeve next -- which will give me a good idea of whether it's doable or not. I'll be sad if it's a no-go, but I've been thinking about what fabulous knit I can make with the yarn if Pam doesn't work out. Having a good fall-back pattern is always a soothing salve for the wounded knitter! It would be too bad if you ran out because the back of the sweater looks great! Oooh, so so pretty, and totally your color. I'm rooting for enough yarn. It would be a shame if you couldn't finish it. Your Pam looks so wonderful! 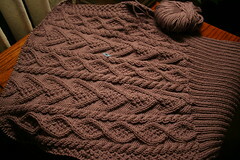 I'm really bummed that I don't have the same yarn you're using so that you can definitely finish. Are you sure it's not more burgundy? I have some of a burgundy! Check out Jimmy Beans site. They have wool cotton half off right now. How many skeins does this call for? I love it, and nearly bought some of the yarn while it's half off, but didn't have a clue how much it would take to make a sweater. OOps, I meant to also say that the back looks fabulous! You must be one fast knitter! It looks great! Even that picture doesn't really do it justice. People, I've seen Shannon's Pam-in-progress in real life and it is soooooo beautiful! That is really beautiful. I hope you have enough yarn. Those are some beautiful cables you have on the back. I'm crossing my fingers that you don't run out of yarn!